Democrat Confederate General Nathan Bedford Forest: the founder of the KKK. Behind him is the Democrat battle flag of the Confederate army. The entire Civil War was a Democrat Party action to destroy America and enshrine slavery. 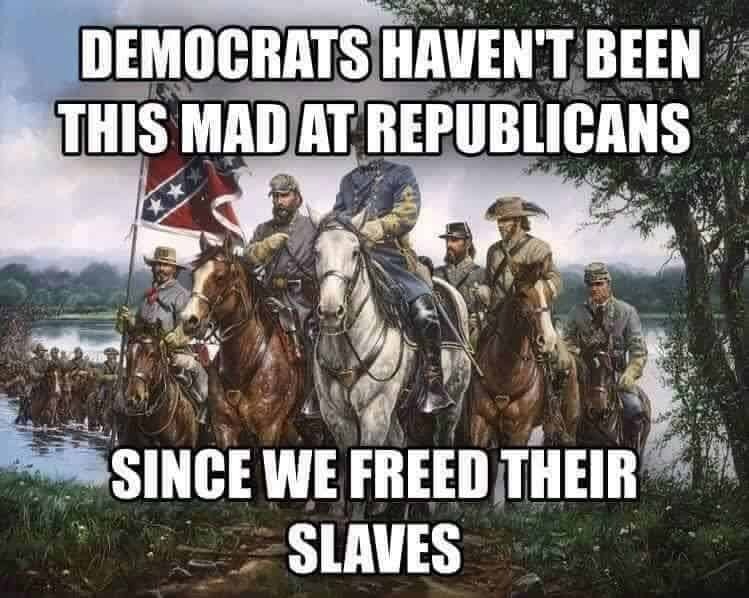 This meme is just stunning by comparing the dems anger today at President Trump to the anger they had for President Lincoln when he freed the slaves! This is just brilliant! The American Civil War was not really the North vs the South, but really it was the slavery Dems against the freedom Republicans. Even after the war was over, it was the dems who used the KKK as its military arm to terrorize and murder black Republicans. It was the dems who used the Jim Crow laws against the black Republicans. It was the dems who used the dogs against the black people in the South, who just wanted their Constitutional Rights. It was the dems who blocked the Civil Rights Act of 1964, while the Republicans passed it. Oh yeah, one of those dems blocking the Act was Al Gore’s father Al Gore Sr! Once again we can clearly good vs evil as the dems are promoting infanticide, destroying marriage between a man and woman, open borders to destroy the integrity of the US, Communism, Islam, gender bending, and whatever else is against God and the USA. We don’t have a shortage of ‘lay people’ in the Church…We have a shortage of people who would stand up!!!! Can I get a witness??? Jesus came to comfort the afflicted….I come to ‘afflict the comforted’…Trust me..I need it too…..Get off dem pews..put on dem shoes…you need to walk,you need to talk…about Jesus.No time to run,no place to hide…we had our ‘free ride’..lets tell them of Jesus…He has the power to save,to free the slave..of sin,and deceit..we fall at His feet…the only place to be…at the feet of King Jesus. GOD BLESS YOU DONALD TRUMP…………..